Photo courtesy of Flickr user "Shapeshift":http://www.flickr.com/photos/shapeshift/. The news out of the Missouri School of Journalism two weeks ago was a little confusing. The school announced it would be requiring all incoming freshmen journalism pre-majors to purchase an iPod Touch or iPhone. At least that was the lede in stories by the Columbia Missourian and The Maneater. The requirement will not be enforced, however, and there will not be a penalty for students who chose not to buy an iPod touch or iPhone, [Associate Dean Brian] Brooks said. The faculty of the school, which had apparently not approved the “requirement” when it was announced, voted to approve it after some heated debate. Now, I may be reading a little too little into the phrase “web-enabled audio-video player,” but it sounds like a laptop (which the J-school already requires) would be more suited to that description than an iPod Touch or iPhone. Perhaps they meant to use the word “mobile” or “hand-held” in that vague terminology, because that’s clearly what they are aiming for in the rest of the FAQ. Rob Weir, director of digital development at the Columbia Missourian, explains in more detail about what the requirement might mean. Now, aside from the ‘recorded lectures’ thing, there are other ways students could use an iPhone or iPod Touch — for mobile newsgathering, for application development, to read news, etc. And teaching students to use an iPhone for newsgathering doesn’t lock them into that API any more than teaching InDesign means you have to use that for design. Kelsey Proud, a junior journalism major at Missouri, isn’t as supportive. She notes that many incoming freshmen do not end up finishing the journalism major, and students are concerned about costs and the utility of the new hardware (as you can read in this Maneater editorial: Journalism school should drop iPhone or iPod Touch requirement). Using iPods to attempt to better educate university students is not new. Duke was the first U.S. university to give iPods to freshmen in 2004. Alex Klein, online editor for the Duke Chronicle, hasn’t noticed that the iPods handed out at Duke made much of an impact on the Chronicle’s online traffic — yet. Klein thinks the iPod Touch/iPhone requirement is not the best approach for Missouri, either. Abilene Christian University was the first university to hand out iPhone/iPod Touch hardware to all incoming freshmen last year. Cade White, assistant professor at ACU, has been pleased with the educational aspects of the iPhone on campus, but the school’s media haven’t taken advantage of the mobile platform as much yet. After wrestling with this story for two weeks, I still don’t have a clear-cut stance on the overall topic. At Eastern Illinois University’s journalism department, we just initiated a “laptop initiative” for incoming freshmen requiring a Mac laptop and software. The justification for a laptop purchase is easier to make because it is a technology that will serve students in all their classes across the curriculum. The requirement for a mobile device is more difficult to justify. It can be done, and the Missouri journalism school has made a reasonably strong case for their initiative. Here are some potential advantages and disadvantages to such a requirement, as far as I can gather. If you know of others, please drop them in the comments. • Establishes most incoming students on a single “mobile” platform — Just like using a single PC or Mac laptop across the curriculum helps eliminate cross-platform headaches, assuming a single “mobile” platform will help instructors as they prepare content. • Allows students to become familiar with uses of “mobile” technology for newsgathering — Students will be able to use these devices to record interviews, send stories from the scene of a news event, and find other uses for small devices in the journalistic space. • Allows students to become familiar with the “mobile” environment/lifestyle — Students who may have never used a smartphone will be able to understand how these devices are used and broaden their perspective on news consumption in the wired world. • Allows faculty to develop and experiment with new ways of educational delivery — Podcasts, videocasts, applications, and other potential delivery methods may open up new avenues of learning. • Allows in-house media platforms to experiment with different ways to deliver content via mobile technology — This requirement will allow the school to test different iPhone apps with a built-in audience, and allow students to share in that development process. That’s especially relevant at Missouri where they’ve had iPhone app development contests. • Requirements that aren’t requirements — I understand the reasoning behind making this a “requirement,” but the double-speak is painful from a journalistic standpoint, and surely will frustrate students who may be satisfied with the mp3/mobile/whatever technology they already have. • Locks students into a single, proprietary “mobile” platform — Apple’s iPod Touch/iPhone platform is only one of several mobile platforms competing in this space. Focusing on that platform ignores other options like Google’s Android, Windows Mobile, the Kindle or other e-reader devices, and other smartphone platforms. • Cost — Is it appropriate to require students to purchase additional technology in this economic environment, when many are already struggling to make ends meet, stay in school and purchase obscenely priced textbooks and other requirements for college? • Ignores future developments that may alter the balance of power in mobile technology — The iPhone/iPod Touch has the “mojo” at the moment in the mobile space. 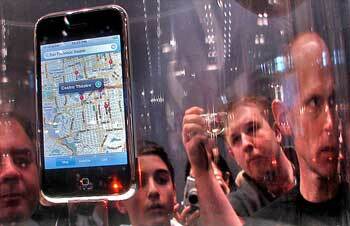 But again, four years is a long time to say one platform will dominate in the mobile universe (see Palm). • Underutilization of technology by faculty — Additional efforts at podcasting class lectures, publishing educational content to new applications, etc. will require additional time investments from faculty. I don’t know about the workload at Missouri, but that additional time will have to come from somewhere. 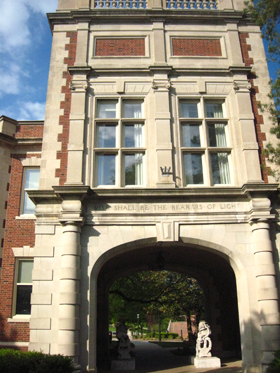 For now, Missouri’s J-school seems set on moving forward with the “requirement,” despite the misgivings. And it will be years before anyone can adequately determine if it was the right decision or not. What do you think? Share your thoughts in the comments below. UPDATE (12:33 PM EDT 5-20-09): The Columbia Missourian’s director of digital development Rob Weir adds some context via an e-mail to me. He says that the lecture-replay possibilities have potential for large classes. Students can “time-shift” and listen again to lectures while they are multi-tasking. Besides audio, still photos and video, students could also use an iThing to text or Twitter breaking news. Our local news station, KOMU, has already had a lot of success covering breaking news with Twitter — a KOMU reporter was interviewed by multiple TV stations in Missouri in the course of reporting on tornado damage. She was tweeting en route to the story and before her on-camera reporting. It led to her not only getting exposure (which is crucial to a student reporter) but also led to her pretty important reporting getting further distribution. You can make the argument that those functions can also be dealt with by using other mobile devices, and you’d be absolutely correct. But the iPhone or Touch also offers specific apps for consuming news, as well as a web browser that beats the heck out of anything else in being able to deal with sites that aren’t opimized for mobile browsers. This year, several teams of students competed to build applications for the iPhone or Touch, and the winning teams got a chance to travel to Cupertino to present their ideas to Apple. In the process, they worked with computer science and engineering students, getting exposure to a broader set of skills than they might have merely from journalism students. And they learned entreupreneurship skills in the process, which we know are important for young journalists. Thanks to Rob for providing some further context for the discussion. Bryan Murley is assistant professor of new and emerging media at Eastern Illinois University, where he advises DENnews.com, the Pacemaker-winning online site for the student newspaper. He is also the director for innovation at the Center for Innovation in College Media, where he leads the weblog Innovation in College Media. He is the college media correspondent for MediaShift. I believe that the most significant disadvantage has been overlooked. By requiring a web-enabled video player, focus is taken farther away from the core skills required for journalism. To learn use of this tool means that first principle are further removed from the course. Effective research and writing skills are diminishing in our secondary schools and are required for decent journalists. At the core of this article is a philosophical debate. The proponents of this new requirement see university as the place where journalists are trained for the job. I disagree, seeing university as the place where students learn to think and use the new knowledge available. It’s not a trade school. Bryan: You’re correct that I am generally in favor of the move. And thanks for the link to my blog. I’m curious, however, as to why you didn’t make an effort to contact me to verify my information, or to give me a chance to further explain my thoughts. My contact info is pretty clearly listed on my blog, and a Google search pops me up pretty quickly. I am generally in favor of the idea. I’d be happy to discuss it further. I work for a company that employs more than a thousand journalists and reporters. We recently tested the iPhone to see its potential as a content production device and found it well below par. Where the iPhone stands out is in content consumption but I would assume students would be more into the creation model. I’m attending University of Missouri’s JSchool next fall and I have opted out of purchasing the ipod touch or the iphone. I find it hard to justify spending 200+ dollars on a device that is not even going to be “required”. There simply isn’t any extra money to spend, what with my out-of-state tuition, room and board, textbooks, and not to mention my $2,000 Macbook pro.